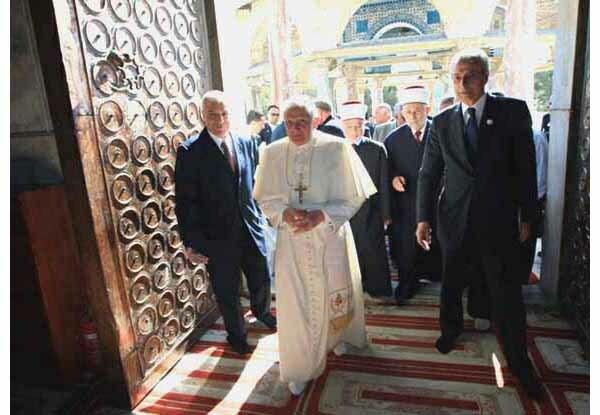 Above, on May 12, 2009, a shoeless Benedict XVI entering the Dome of the Rock, the third most venerated site of the Muslim religion. When Saladin took Jerusalem from the Crusaders in October 1187, one of his first actions was to destroy the Cross atop that building and replace it by the Crescent. That act - rich in symbolism - demonstrates the opposition of the two creeds: the Catholic Faith professes Our Lord Jesus Christ as true God and true Man; the Muslim religion denies it. 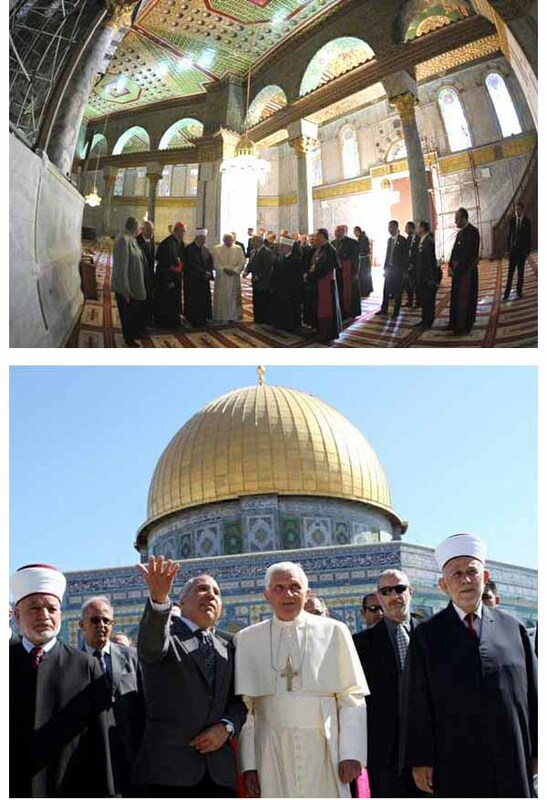 By the simple fact of entering the Dome of the Rock , Benedict XVI paid homage to the Muslim religion. Further, by doing so without shoes and beginning his speech with Arabic greetings he emphasized his homage. Thus, he sent the message that the dogmas of the Church affirming that Our Lord Jesus Christ is God must be disregarded in order to achieve human unity. This intent was made explicit in his speech when he invited all men and women of good will "to overcome the misunderstandings and conflicts of the past and to set out on the path of a sincere dialogue aimed at building a world of justice and peace for coming generations" (read full text here). He also symbolically deemed as illegitimate the great epopee of the Crusades, which in 1099 recovered Jerusalem from the Muslim usurper and established it as the capital of the Eastern Catholic Kingdom including all Holy Land territories. Instead of presenting himself as the Vicar of Christ, whose name Benedict XVI carefully avoided mentioning, he appeared more as a fellow-worshipper of a vague undefined God whose "oneness is inextricably tied to the unity of the human family." It is not, therefore, belief in Our Lord Jesus Christ that should forge the unity of mankind, as we learned in the Catholic Church. To the contrary, it is the search for unity that must shape the concept of God.